Summary: Oil painting showing a great waterfall (Niagara Falls). The sky is blue with white and grey clouds. There are green trees in the foreground. 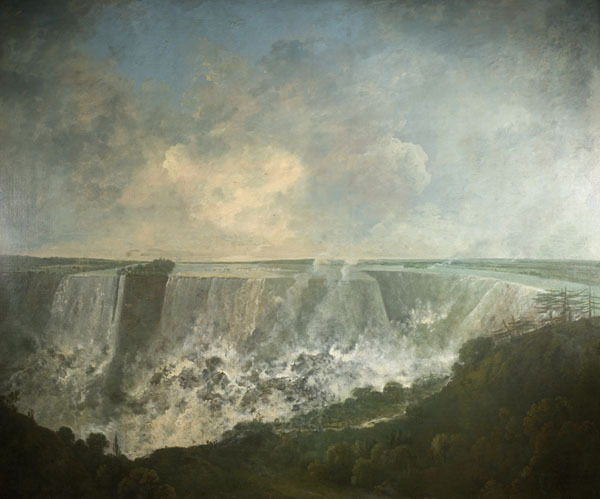 Description: The painting shows the Niagara river and its great waterfalls that form the Canadian and American border. The first European to see the falls in 1678 was Father Hennepin, a French priest, whose description made them one of the natural wonders of the world. The artist never saw the Niagara falls in person but he was able to work from a drawing made on the spot by a military draftsman two years earlier. Paintings of exotic places and awe-inspiring scenery were very popular at this time. Description: Richard Wilson was born in Wales. He began his career as a portraitist but changed direction and became a landscape painter. He is seen historically as one of the founders of English landscape painting. 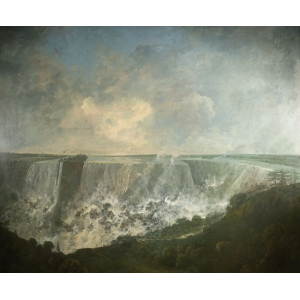 Wilson's subjects included landed estates, but his painting of Niagara Falls represents the grandeur of an untamed wilderness rather than a landscape managed by the aristocracy. It was painted when Britain was the dominant power in North America and shortly before the American War of Independence. Wilsons painting is an example of the representation of nature in the 18th century, which was described in different ways by topographical works, scientific treatises and poetry as well as art. The painting was commissioned by William Byrne (1743-1805), the engraver and first exhibited at the Royal Academy in 1774. Byrnes steel engraving of 1774 popularised Wilsons image. Wilson had not actually seen the falls himself and seems to have based his painting on a drawing by a Lieutenant Pierie of the Royal Irish Artillery. Byrnes engraving is inscribed "Richard Wilson pinxit from a drawing taken on the spot by Lt. Pierie of the R.I. Artillery 1768". Pierie was a draughtsman and recorder who carried out a topographical survey of the falls in 1768. On Byrnes death the painting passed to his friend and former pupil John Landseer. It was acquired by T. M. Whitehouse after 1855 and presented to Wolverhampton Art Gallery in 1884.